Safety and Security Clear or tinted to hold glass together for security or safety Solar Protection Clear or tinted films reducing heat Glare Reduction Lightly tinted film through to full mirror effect Fade Reduction Clear and tinted film reducing uv light Insulation Saving up to10% winter heat loss Privacy and Decorative Etch or color films for improving privacy Glazing Manifestation Color or etched films full color graphics or single dots Anti Graffiti Clear film to protect glass from scratching and damage Vehicle Tinting Tinted or security tinted films to enhance the look of your vehicle Conservatory Film for glass or plastic to reduce heat, glare & uv light SSAF WINDOW FILMS have been working with window film since 1976 and are one of oldest companies In the UK. 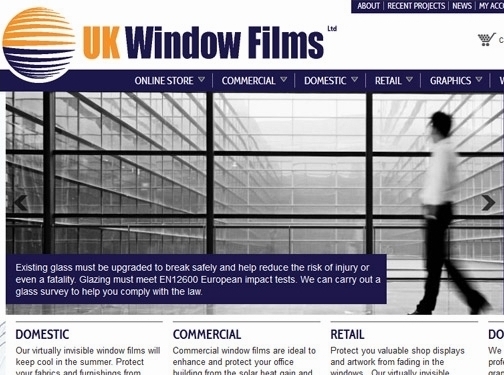 UK (Liphook) based business - with over 20 years' experience - providing window film products and other accessories. Website includes e-commerce facilities, delivery and returns information, terms and conditions, work examples (recent projects), testimonials, FAQs, full contact details.